May 2015 - Minor nomenclature updates. April 2018 - web links updated. These procedures outline the nature, processes and management of the enterprise finance systems of the University. Workflow - a depiction of a sequence of operations, declared as work of a person, work of a group of persons, or work of an organisation. In the case of UniFi, the system defines workflows which a number of staff can participate in, depending on their role. The process of entering and transferring information within the system is defined as a workflow. Work List - A digital in tray that is used to access workflow tasks that need to be completed by a user. Section 15 of the Financial and Performance Management Standard 2009 states that the University must establish systems to manage its financial resources. Section 27(3)(a) of the Financial and Performance Management Standard 2009 states that, in developing and implementing the financial information management system, the University must apply the mandatory principles contained in the information standards issued by the Queensland Government Chief Information Office (QGCIO). QGCIO provides Queensland Government agencies with guidance and support on improving the delivery of Queensland Government services and developing best practice approaches to ICT management. FBS offers and supports a number of financial information systems which assist with the financial management of organisational units. The UniFi system was implemented 5 January 2009 to manage the financial management of the University’s finances. 4. Interfaces to external systems. A number of pre-defined workflows have been configured in the UniFi system. Workflows are established for particular types of transactions. The role that a person plays in a particular workflow will depend on their role within UQ and the work they are required to perform for the University. The work list is used to identify which work should be completed next by a user. Information is entered into the system via the web-based applications or is transferred electronically via interfaces. All financial data is held in a central database, which is copied nightly to the University’s data warehouse system known as Business Objects. 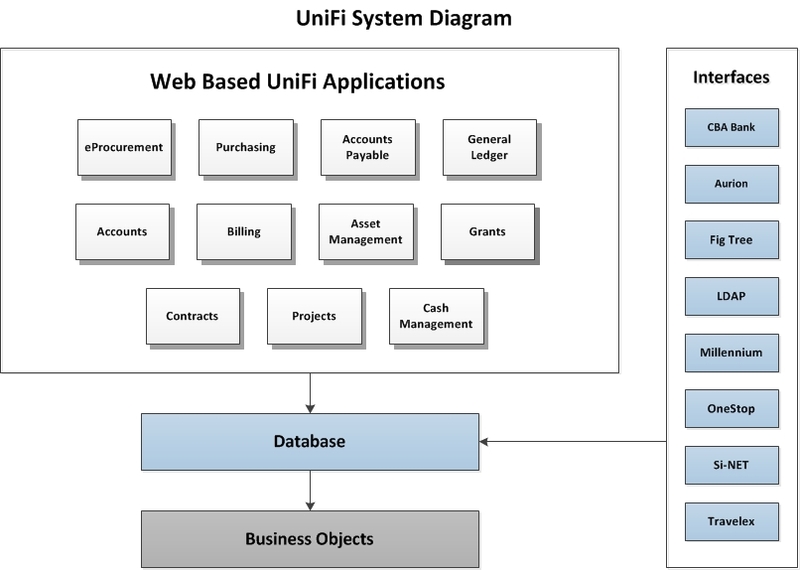 Management reports can be produced either directly from UniFi or from Business Objects. UniFi can be accessed from the my.UQ home page. In order to access the system, the user requires a logon and password. A logon and password for UniFi will not be provided unless the user has completed the training that relates to their UniFi role. The UniFi user access form needs to be lodged to request access to UniFi or for registering a Financial Delegate with FBS. The modules have complex relationships and interdependencies. However, the end objective is to ensure that data is entered on a timely basis and that reports are produced on a monthly basis to support management decision making. As an example of the data flow, information is entered in the eProcurement module, which then flows to the Purchasing module. Once the purchasing process has been completed, data is transferred to the Payables module so that suppliers can be paid for goods and services provided. At the conclusion of the Payables processes, the final debit and credit entries flow to the General Ledger. The General Ledger – often referred to as the “GL” is the primary source of information for management and financial reporting. Business Objects is a proprietary business intelligence tool developed and marketed by SAP. UQ uses Business Objects to combine and report on data from a number of University systems. Each database is known as a Universe and is designed to meet the specific needs of users and user groups. All information from the web-based applications and the interfaces are stored in the database. The database is then scheduled to update Business Objects every night, thus ensuring that reporting includes the most up-to-date information. 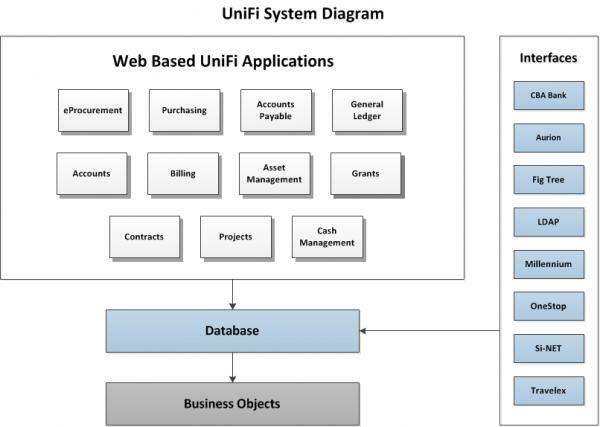 The use of financial systems external to the UniFi Finance System requires a written submission to the Chief Financial Officer for consideration. The business case must outline the business requirement and proposed electronic financial platform for the processing, recording and extraction of financial data. November 2017 - Link updated. 15 March 2018 - Form URL updated. This form is used for requesting the setup of new product templates in the OneStop cashiering system. May 2018 - Form URL updated. June 2018 - URL updated. Use this form if you require a facility for accepting online payments (Credit Card and BPay). See www.fbs.uq.edu.au/online-payments-system for further information.